Firstly, I'd like to thank all of you who showed such a vote of confidence in me yesterday by commenting that you thought I was going to fall. It's not like I was born in Alaska or raised in Canada or anything... oh wait! Maybe next time, eh? With all the happy talk about global warming, it's easy to forget that we're just as likely to one day plunge into another ice age as we are to burn away. When the earth begins to plunge in temperature will you be prepared to survive the inevitable snowpocalypse? Luckily for you, I have some tips to help you get through. The first thing any real estate agent worth a darn will tell you is that when selecting your domicile for the end of the world, it's all about three things: Location, location, location. Now you might be tempted to think that up north might be the best because they're already equipped to deal with cold. While there is some logic to that (especially if we're talking about a pole reversal) I would like you to consider the charms the south has to offer. There are many lovely large houses that under snow will provide a nice quiet shelter. Especially since if you figure that most people in the south freak out when it flurries. The idea of southerners handling a snowpocalypse is laughable. That means every neighborhood will be a quiet place to raise a family. You just have to remove the Popsicle'd previous tenants first and you'll have your pick of shelter. Don't worry, they won't mind. And talk about your fixer upper projects. Anyone who likes a little DYI will be in heaven. Mr. Freeze-y Pop is a sight you'll just have to get used to. Try not to feel too sorry for him though, there was a perfectly good unlit fireplace right there and he wasn't using it. Course in the long run, it's better to choose a place in the city. Depending upon how deep the snow is, apartment buildings might be the only places high enough to get any real sunlight. And in the city you'll be able to get canned food. A taste you should get used to as it'll be the only food source for awhile. Another reason why the soon to be largely unpopulated south is a good choice. 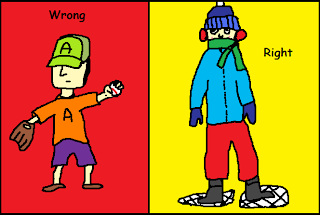 I'm sure almost everyone knows that when it comes to dressing for cold weather, you always want to dress in layers. The reason is because dead air will get trapped in between the layers of fabric and this is what keeps you warm, more so than the fabric itself. 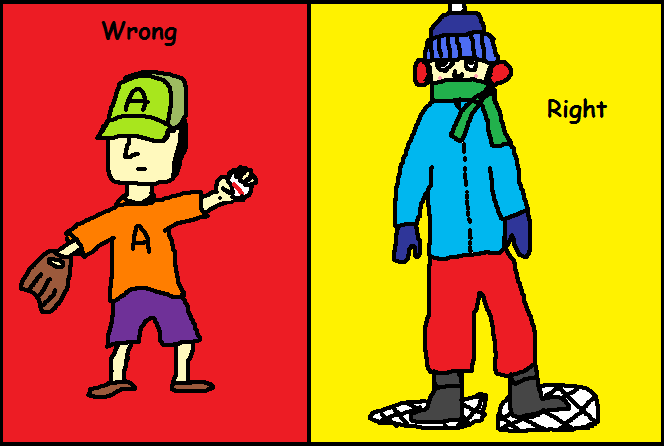 However if you're going out in sub-temperatures, you should also note that dressing heavy means you risk sweating if you exert any energy while trudging. And walking in snow in a good way to work up a sweat. The problem with that is that if you sweat, it'll freeze to your body, quickly lowering your body's temperature. So you must monitor yourself and take time to cool off if you start to sweat. Also, because of the energy you'll expend, remember to carry water with you. Dehydration is a killer in the cold. Snow shoes are a great way to cut down on the work of walking through the snow, by allowing you to walk on top of it (sort of). It's also a great way to keep safe should the snow get so high it covers up houses. The last thing you need is to fall through a section of soft packed snow. First of all, you shouldn't be playing baseball during the snowpocalypse. Secondly, orange and purple with a green hat? Not a good combo. On the other side, our man looks good to go. Though if he had a hood to go over that it would be better. Remember, the old adage about losing 40% of a body's heat through the head is actually a myth, but it's still a good idea to wear a hat, because any area left uncovered will be susceptible to the weather. This goes double for the face so whether or not you like it, scarf up. What's that you say, you don't have a fireplace? That does present a problem, as your snow filled existence is going to be a mighty cold (and dying) one without proper heat. So what are you supposed to do if you're living somewhere without a fireplace? I'm afraid to say this is one of those big spots where the clever are going to live while others either freeze to death or burn their buildings down. Problems arise in great numbers. If I start a fire in a metal trash can, how do I keep the smoke from filling up the place? If I open the window, to let it out, doesn't that just let in more cold? Who did shoot J. R.? Well, I can't help you with the last one, as I never watched Dallas. But I can provide you with some ideas to stay warm. "The family that sleeps tucked in close together, doesn't die a frosty death." Not catchy, but still smart. Remember what I said earlier about layers trapping dead air? It works on a larger scale too. Making a small room within a room, with curtains or blankets, not only will create a trapping but will also make your own a body furnace inside the enclosure. This has nothing to do with heat, but seriously, don't eat the yellow snow. In a pinch, a small metal container, mostly closed, with several lit candles will make a small temporary heat source. Ultimately, cold doesn't necessarily require fire to stay warm. Igloos are made out of snow and keep people warm with their own body heat. Living is just harder without fire. If one is willing to put in the work (and without TV, what else are you going to do?) you can turn an oven into a fireplace. Some modifications are necessary, obviously, but it's a shell that's already built to withstand heat. With some tubing, one can even direct the smoke out through a small cracked window. Remember, if you're really desperate, a small fire can be made in an iron pan. Just watch the smoke. There's simply no way of knowing how long the after effects will be felt. It could be years before any balance in the seasons is reestablished. Until then, life will be about making do with what you have around you. If you stay warm, keep a level head, and think before you act, you'll make it through to warmer days again. LOL...when my daughter was out stranded in that snowstorm, she said she was melting snow in Timmy's cups in order to stay hydrated. I told her to stay away from the yellow snow, too! HA HA HA. It's in the South, has a big Wal-Mart - so plenty of canned food, and I could loot Disney costumes to keep warm. So lighting the couch on fire is bad? Check! Kudos to using my FAVORITE FONT on your artistically-rendered screenshots: Comic San Serif! I always knew you were a man of good taste. Dehydration is a killer in the cold. <-Great line. A stiff drink is always useful in surviving the winter too. Also - this makes me think it'd be fun to see a vid where you're the snarky college tour guide of sorts talking about dos and don'ts while people all around you are dying or surviving while acting out the dos and donts. Didn't Katherine Wentworth shoot JR? Why do I even have an inkling of this? Wow, your prep advice is top notch. Love the fire in the oven. And your living room is stunning. Okay, first of all, what's this stuff about no TV? Does snow effect nuclear power plants? Nope. If anything it helps cool the big fat reactors. Secondly, how hard is it for NBC to send out a signal and at least air reruns. Sure, that's what they basically do now, but why stop? Also, there's no snow in space, so use some of Australia's satellites to send the signal, since the Aussies would all be dead anyway. Another thing: If, by the time the snowpocalypse comes, we haven't developed the technology to make the weather do what we want, then I'll be skiing to D.C. and when I find the president, I'm going to eat him/her, seeing as food resources will be low anyway, and cannibalism is inevitable in that kind of situation, and I may as well break the ice for everyone else, no pun intended. But thanks for the tips. I just woke the baby up laughing at your popcicl'd neighbors picture TS, thanks lol..